Recent tax credit proposals to help low- and middle-income families, such as Senator Kamala Harris’ LIFT the Middle Class Act, are being hotly debated. 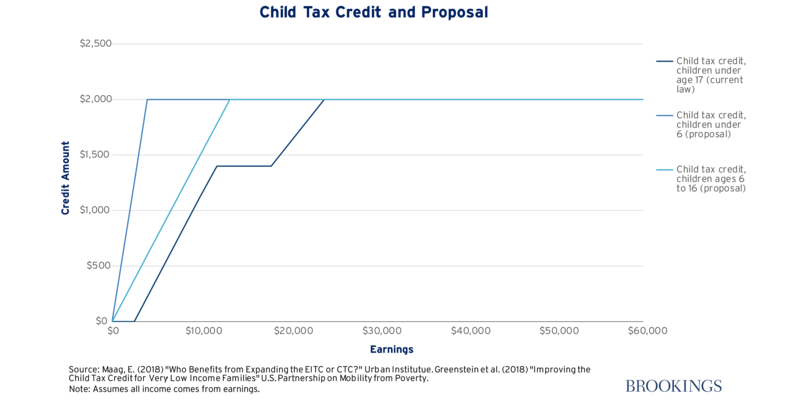 We examine the ability of these proposals, the current earned income tax credit (EITC), and the child tax credit (CTC) to achieve three goals: reducing poverty, making work pay, and supporting children. While these goals overlap, it would be a mistake to ignore the tradeoffs involved when deciding which goal to prioritize. In this context, the EITC stands out: it reduces poverty, supports work, and supports children. Efforts to expand the EITC, specifically the GAIN Act proposed by Senator Sherrod Brown and Representative Ro Khanna, thus also have strong appeal. A worker tax credit is also promising, specifically to support work. Recent expansions to the CTC are not likely to be socially beneficial, especially given their costs, but there is a strong case to reform the CTC to better target poor families. Reducing Poverty. The EITC and the refundable portion of the child tax credit have been very effective in reducing poverty. In 2017, these credits lifted 8.3 million people out of poverty, including 4.5 million children. In fact, families in the lower end of the income distribution have seen their incomes rise mainly due to tax credits and other government transfers. For the bottom quintile, incomes after taxes and transfers increased by 79 percent from 1979 to 2015. This good news has led some to argue that President Johnson’s War on Poverty has been won. While that conclusion may be too strong, the EITC, SNAP, Medicaid, and some smaller safety net programs have clearly made a big difference. Making Work Pay. Wages for less-educated workers have stagnated since the 1970s. This fact along with the exit of many men from the labor force has made work more central than ever to the policy debate. While the EITC has had strong positive effects on employment and labor force participation, these effects have largely been among single mothers. According to Meyer and Rosenbaum, the EITC expansions from 1984 to 1996 accounted for over 60 percent of the increase in annual employment rates among single mothers during this period. The EITC is less equipped, however, to increase hours of work or to encourage a second earner to join the labor force. And because the benefits for individuals without children are currently very small, there has been considerable interest in expanding the credit to all low-wage workers in hopes that this might affect their employment rates as well. A recent randomized controlled trial testing an expansion of the EITC for childless workers did find modest increases in employment, but these increases were largely concentrated among women. One reason for low take-home pay is the big bite that payroll taxes and child care or other work-related expenses take out of a modest paycheck. Indeed, the original purpose of the EITC was to offset the burden of payroll taxes on low-income workers, but there are many workers who, while low-paid, do not qualify for the EITC—either because they are just above the eligibility threshold and/or do not have children—and who end up paying a higher proportion of their income in taxes than those higher up the income scale. Beyond its economic benefits, work has social, emotional, and psychological benefits. Declining labor force participation among men has been correlated with rising rates of early death and less marriage. Policies that can effectively encourage and reward work are politically appealing and can benefit the economy, individuals, and communities. The inherent value of work was emphasized many years ago by the Nobel-prize winning economist Edmund Phelps. In his book Rewarding Work, he proposed a robust program of wage subsidies that would top up the pay of all low-wage workers. The Making Work Pay tax credit, part of the American Recovery and Reinvestment Act of 2009, is a recent example of a tax credit directly targeted at raising wages. The idea has resurfaced in recent debates. For example, in The Once and Future Worker, Oren Cass proposes a wage subsidy. In 2015, Elaine Maag proposed a worker tax credit. Similarly, in The Forgotten Americans, Isabel Sawhill proposes a worker tax credit. Unlike the EITC, these proposals are based on individual earnings rather than on family income, family structure, and the number of children in a family. Elaine Maag has aptly summarized the benefits of a worker credit based on personal rather than household earnings and why it might be better than simply expanding the EITC. The EITC provides little or no work incentive for individuals without children, discourages work by second earners, creates marriage penalties for some couples, and, because of its complexity, delivers more than a quarter of payments in error. These high error rates are related primarily to the difficulty of determining who is a qualifying child given considerable instability in living arrangements among low-income families. Personal earnings, in contrast, are easier to verify. Supporting Children. Some argue that society benefits from having more children and, therefore, that the costs of raising children should be spread over the entire population. This idea of children as a public good is often invoked in the context of paying for entitlement programs such as Social Security. Because each working-age generation pays for the retirement benefits of the prior generation, if fertility declines or longevity rises, the payroll tax burden of supporting the elderly population will rise. Put another way, the cost to parents of raising children are mostly private, but produce public benefits in the form of a more fiscally sustainable retirement system and more economic growth. However, Sawhill has argued that modest changes to the tax system are unlikely to affect fertility, that children are already heavily subsidized (via expenditures on their education and health care), that another way to increase the number of workers per retiree is to allow more immigrants into the country, and that higher fertility has costs as well as benefits—environmental costs in particular. The tax system used to have a personal exemption tied to the number of children in a family. In 2017, that exemption was eliminated and replaced by reforming the child tax credit, including doubling the credit amount from $1,000 to $2,000 and extending eligibility to higher-income families, at a (marginal) cost of over $68 billion per year. Although the credit is partially refundable at the bottom, this expansion mainly benefited middle- and upper-income households. Whether such expenditures are justified or not depends largely on whether one believes children are a public good and also on whether parenthood limits one’s ability to pay taxes or, instead, is a matter of choice like any other expenditure of funds, and thus not deserving of special support. To be clear, we are not here talking about disadvantaged children who may benefit when tax credits enable their families to escape poverty. We are talking about tax credits that go to 91 percent of all families with children, as in the case of the current child tax credit. Given its high cost, it’s worth taking a harder look at its rationale. 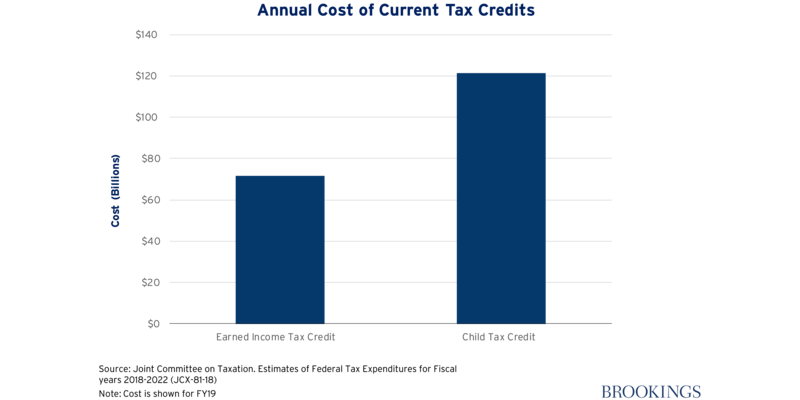 The primary tax credits affecting families in current law are the earned income tax credit and the child tax credit. The first is primarily aimed at reducing poverty and the second at supporting children. There is, at present, no tax credit whose primary objective is to encourage work. Here we briefly review the details of the EITC and the CTC before looking at several recent proposals to amend current law. The earned income tax credit was signed into law by President Ford in 1975 and has been subsequently expanded several times. The size of the EITC is dependent on earnings, on the presence and number of children, and on marital status. 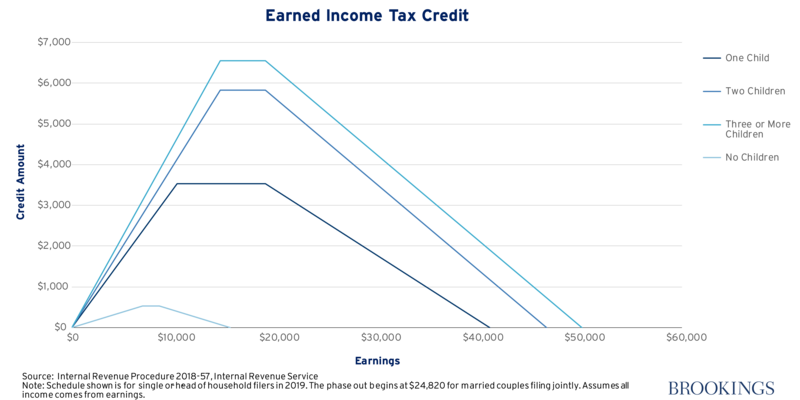 The graph below shows the EITC schedule for single and head-of-household tax units by family size. For each group, the credit increases with earnings up to a cap, remains constant at that level, and then phases out as earnings rise to still higher levels. The schedule for married tax units is very similar, except that the earnings level at which the phase-out begins comes later. As an example, the income of a single parent with one child is boosted by 34 percent up to an income of just over $10,000 a year. In other words, for every dollar they earn, they would receive a subsidy of 34 cents. 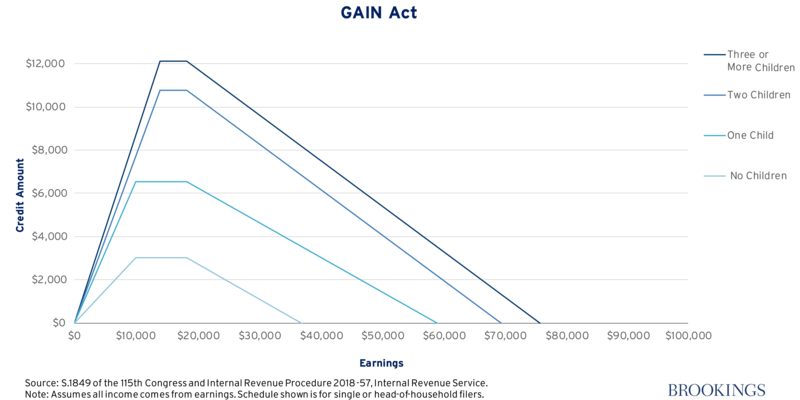 Between $10,370 and $19,030, the maximum benefit of $3,526 remains constant. As income rises above $19,030, the benefit begins to phase out so that for every additional dollar earned the maximum credit is reduced by about 16 percent until it is entirely eliminated at an income of $41,094. Note that for a single parent with three children, the maximum benefit is $6,557 and doesn’t phase out entirely until their income reaches over $50,000. The EITC has an annual cost of over $71 billion. The tax credit that most directly supports children is the child tax credit. 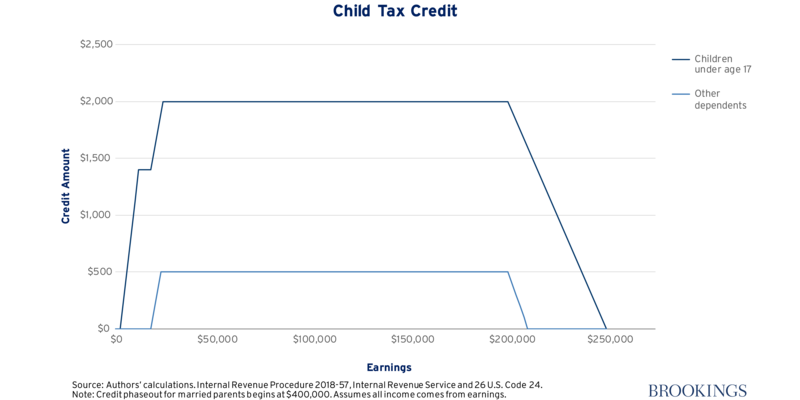 In 1997, the original child tax credit was worth $400 per child. It has since been expanded several times, most recently in 2017, and now provides $2,000 per child under age 17. Families can receive up to $1,400 of the credit as a tax refund. This refundable portion of the child tax credit has a phase-in rate of 15 percent starting at $2,500 in earnings. It is indexed for inflation, meaning that the $1,400 will eventually be worth the full value of the credit ($2,000). The CTC also includes a more modest nonrefundable amount, $500, for dependents who are 17 and 18 years old, 19 to 24-year-olds who are full-time students, and older dependents. The CTC extends far up the income distribution, beginning to phase out at $200,000 for single parents and $400,000 for married couples. While less regressive than personal exemptions, the CTC still provides large benefits to families with high incomes. A key distinction between the CTC and the EITC is refundability. Since the EITC is 100 percent refundable, it is quite effective at targeting those at the bottom of the income distribution. The CTC does not share this feature, so it provides relatively fewer benefits to those with little or no income tax liability. Further, the CTC offers the same benefit amount per child, while the EITC benefit per child reduces as the number of children increases. This means that, among larger families, higher-income families receive relatively higher benefits per child from the CTC, than do low-income families from the EITC. Another key distinction is that the CTC has a long plateau, meaning it varies hardly at all with earnings and work effort. A childless couple with two earners each working at the minimum wage receives less than a rich family with only one earner but with one child. The CTC has an annual cost of over $121 billion. A battery of recent policy proposals has attempted to reform or supplement the EITC and CTC. Here we look at several of them and evaluate their effectiveness in achieving the goals of reducing poverty, making work pay, and supporting children. The GAIN Act, proposed by Senator Sherrod Brown and Representative Ro Khanna, expands the EITC for both childless adults and families with children. The expansion would nearly double the maximum credit for families with children and increase the maximum credit for childless adults by a factor of six. The LIFT the Middle Class Act, proposed by Senator Kamala Harris, is a refundable tax credit plan that would provide large subsidies to low- and middle-class individuals and families. The credit would match the first $3,000 a single person earns, and the first $6,000 for a married couple. The maximum credit begins to phase out at $30,000 for childless individuals, $60,000 for married couples, and $80,000 for single parents. This credit would be in addition to the EITC, rather than expanding or replacing it. In The Forgotten Americans, Sawhill proposes a worker tax credit with the goal of making work pay. It is very similar to Elaine Maag’s proposal for a worker tax credit. The credit would boost workers’ incomes by 15 percent up to a maximum credit of around $1,500, phasing out completely by $40,000. The figure below also shows more generous options. The worker tax credit would be based on individual (hourly or full-time equivalent) earnings, would be supplemented by a portion of EITC benefits in cases where they were greater than the worker credit, and would be delivered through paychecks. Concerns about low-wage workers in higher-income families could be addressed via a simple income cap, though these will likely be rare cases. Maag and her colleagues argue for a fully refundable child tax credit. The proposal would allow families to count all of their earnings toward the CTC, make the credit fully refundable for families with children under 17, and increase the phase-in rate to 50 percent for families with children under the age of six. This proposal would lift 1.2 million people out of poverty. 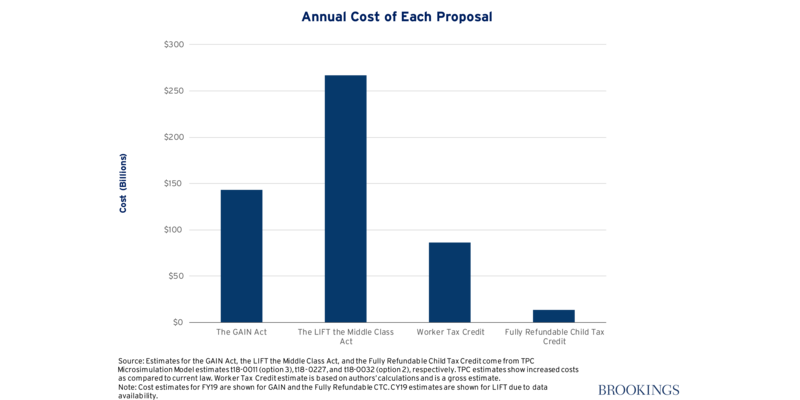 The following figure compares the costs of these four proposals. 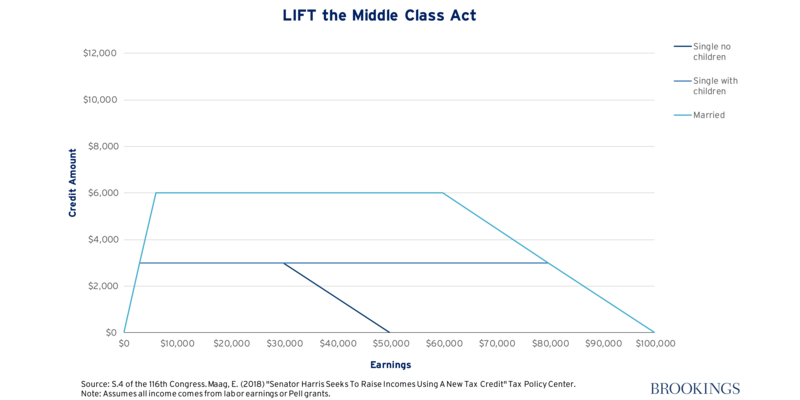 The LIFT the Middle Class Act is the most expensive at $267 billion, followed by the GAIN Act at $143 billion, the worker tax credit at $86 billion, and Maag’s fully refundable child tax credit at $14 billion. As a reminder, the current EITC and CTC cost $71 billion and $121 billion, respectively. Each proposal above has its merits, but they come with very different price tags, and the best course of action depends on which goal is considered paramount. The two figures below show the proportion of benefits that flow to the bottom two income quintiles for current law and each proposal, respectively. From a poverty-reduction perspective, the current EITC and Maag’s proposal to provide a fully refundable CTC are the clear winners. The clear loser is the current CTC for the obvious reason that most of its benefits flow to higher-income families. The Maag proposal is very well-targeted and improves on a system that is highly regressive. In the current political environment, that may be the best one can hope for. 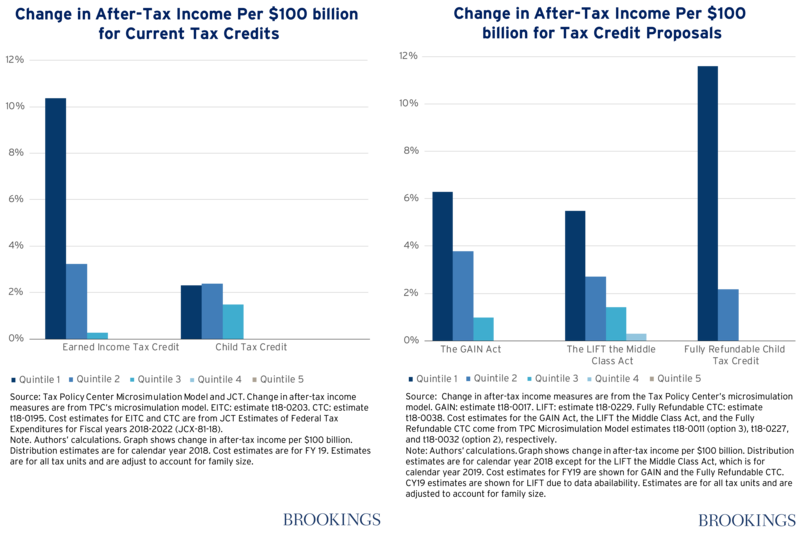 Another way to evaluate the progressivity of each option is to look at changes in after-tax income. The two figures below show after-tax income distributions for current law and each proposal, respectively. Because the costs of each option are very different, we have adjusted for this by looking at the effects per $100 billion spent. Estimates for the worker tax credit are not currently available. Based on this metric, one can draw the same general conclusions. The current EITC and a fully refundable child credit are the winners. The current CTC is the loser. The other options fall somewhere in the middle. If the goal is to increase the returns to work, then a given policy should either directly encourage work or require work to receive the benefit. In principle, the size of the benefit should vary directly with hours worked per year rather than with total income, the number of children, family structure, or other attributes. In practice, the benefits have to be phased out at higher levels of earnings to make the policy affordable. It’s worth noting that an individual with high hourly earnings who only works part-time or part of the year can qualify for the EITC, especially if they have several children, but might not qualify for a worker tax credit because their hourly earnings or full-time equivalent earnings are too high. Conversely, a married family with two earners, each earning very modest wages, might be ineligible for the EITC based on total family income, but would still qualify for two worker tax credits. 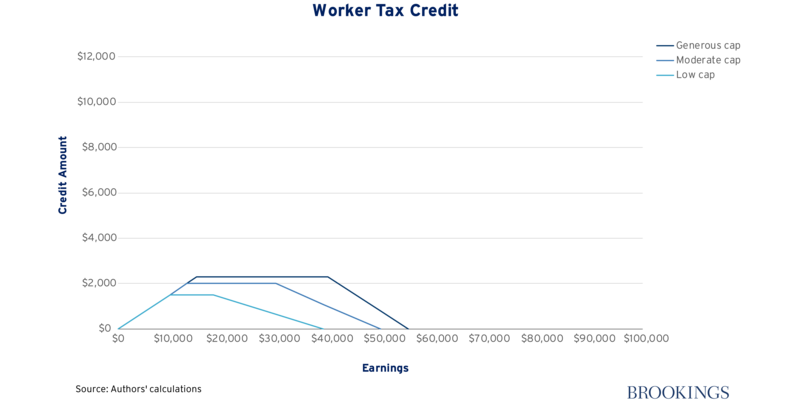 In short, the worker tax credit stands out in its direct relation to work. It is simple and would therefore reduce the kind of error rates that have plagued the EITC. Specifically, the worker tax credit could be administered along with the payroll tax via negative withholding, something both employers and the IRS should be able to administer. (The Treasury would repay the relevant trust funds that are supported by the payroll tax.) The worker tax credit would offset payroll taxes and work-related expenses. It would encourage higher labor force participation to the extent that employment rates are responsive to wages. Existing evidence suggests that these employment effects are modestly positive, with elasticities in the range of 0.1 to 0.3 for low-income childless workers over a three-year period, though higher for women and lower for men. A worker tax credit is marriage friendly and would encourage two-earner families since benefits are based on individual earnings not family income. While we do not yet have estimates of distributional impacts, and there is still some debate as to how to structure a worker tax credit, we believe that if making work pay is the goal, then a worker tax credit deserves more attention. 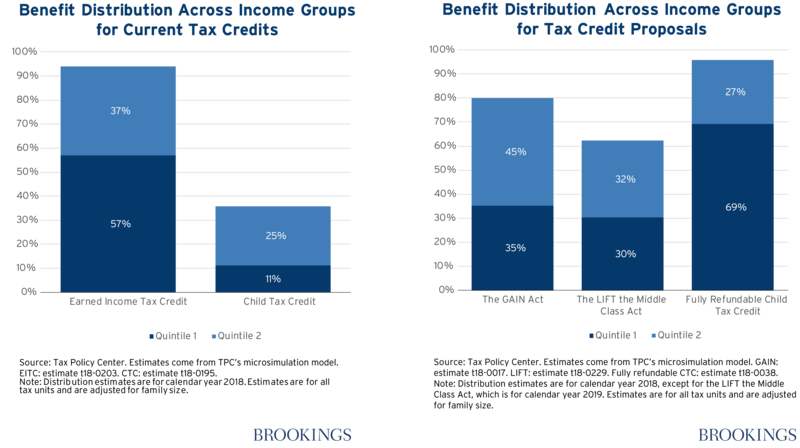 Although a worker credit is the purest example of a tax credit based on work, the EITC and the GAIN Act also base their benefits quite strongly on work. In contrast, the LIFT Act’s benefits are less linked to work (as shown above, the schedule is flat over a large range). The CTC is by definition not linked to work, except at the very bottom of the distribution, and then only weakly. Quite obviously, the CTC wins on the criterion of supporting children. Although the idea of supporting all families raising children is laudable, it is an expensive proposition that must be contrasted with what else could be done with the same funds. As noted above, it is not entirely clear that the social benefits of supporting children exceed the costs to taxpayers of providing these child-related benefits. Still, helping parents offset the costs of raising children resonates with many people and the very generous CTC expansion adopted in 2017 is unlikely to be substantially modified any time soon. Smaller reforms, such as making the current credit more fully refundable at the bottom or limiting extra benefits to larger families or those at the top of the income distribution, could gain some traction. In this review, we have tried to make very sharp distinctions between the three goals that have historically motivated providing tax credits to families. Of course, policymakers are often motivated by more than one goal. But it is vitally important to be clear about what the goals of any proposed reform are, so that it can be assessed appropriately. In this context, the EITC looks like a triple winner: it reduces poverty, supports work, and supports children. Efforts to extend its reach, such as the GAIN Act, thus have strong appeal. We also like a worker tax credit because of recent concerns about stagnant wages and falling employment rates, but it is a new entry in the policy arsenal and might best be piloted in a few communities or states to see what effects it actually has on employment and earnings. We are less convinced that recent expansions to the CTC will be socially beneficial, especially in light of their high costs. But there is a strong case for revising the CTC to provide more help to families at the bottom and fewer to those at the top. Tax credits are a powerful tool for helping working and middle-class families, many of whom are feeling under economic pressure. The new Congress has a chance to offer real help: but should do so on the basis of clear goals and solid evidence.